Give yourself a high-five. Your kids are ready for a surf trip! You’ve put in the hard work to teach them to swim, you’ve taught them the basics of ocean safety, and they’re (almost) as stoked as you are. Here at WRSC, we’ve taken care of everything so that you can have a great experience with your family. All you have to do is get here! Passports and documents. Traveling to Costa Rica requires a passport valid for at least 6-months beyond the dates of your trip. Check the U.S. State Department for any special requirements regarding traveling with children. Research these requirements well before your departure date. Guidebook or phrasebook. English is spoken just about everywhere, but knowing a few key phrases (think beyond hola and gracias) is fun and will open the doors to a deeper interaction with the locals. Pretty soon your kids will be picking up the local lingo and teaching you. A guidebook is a great way to learn about your surroundings, find restaurant ideas, and read up on other attractions. Here’s at WRSC, we have great wifi, but we recommend a guide book because it’s good to get off your screen for a little while. Devices and chargers. You don’t need to buy a brand-new iPad for your trip. A simple e-reader with a few games and books works great. Or format an old smartphone as an audiobook player; downloading books your child likes is easy (and can burn oodles of time—the first Harry Potter book is 9 hours long). And don’t forget the ear buds/headphones, and chargers. Costa Rica uses the same electrical current and plugs as the US, so you won’t need any fancy converters. Sticker books. These are great for preschoolers and kindergarteners that like to keep their fingers busy. They only last about an hour, though, so make sure you have other entertainment planned. They’re also fun to do together. Special snacks. Look for the fun or new items that your kids haven’t tried yet, or that you won’t buy because it’s expensive/contains corn syrup/turns their tongue purple/obnoxious (such as gum). Surprise them with the little box of frosted animal cookies, or a mini bag of a fun snack you’ve said no to in the past. Make sure to also bring plenty of “real” food and an empty water bottle that you can ask your flight attendant to fill so you and your kids can stay hydrated. Journal and a few colored pencils. Travel opens up kids’ curiosities as well as exposes them to the world’s differences. Helping them record these thoughts in a journal can be a fun and rewarding pastime. Some schools may even require your kids to complete a writing assignment about your trip, so journaling with them will put them ahead of the game when they return. You may be pleasantly surprised at what your kids say about their travels! Sunscreen. Ideally, you’ve tested out a few brands before your trip and have found one or two that your kids tolerate and that doesn’t give them some weird rash. Sure, almost all surf destinations around the world have pharmacies that sell sunscreen. But they may not have your favorite brand, and plan to spend double what you paid in the U.S. Most pediatric dermatologists agree that a mineral-based sunscreen, including ones with a high amount of zinc, are best, and that paying for anything over SPF 50 isn’t worth the money. It’s also a good idea to have a variety of options: rub-on, spray, and stick. You’ll need to reapply throughout the day so make sure you have enough. Don’t forget lip balm—SPF 30 if possible. Swimwear. A few swimsuits and a couple of pairs of board shorts for girls and 2-3 pairs of trunks for boys is enough. There’s no need for fancy swim attire, or to bring twenty bikinis. Go with what’s comfortable and tested. A rash guard is an excellent idea too, both for comfort and for sun protection. These should fit snug so they don’t bunch up or flap around. Sun hat. Protect your child’s delicate skin with a hat at every opportunity. A trucker hat, visor, wide-brim sombrero, or having a rotation of all of these is great. Getting your child to surf while wearing a hat is even better. Booties (optional). The truth is that even the sandiest beach has the occasional rock, and a healthy ocean has critters living in the shallows. Some kids will be more confident plunging into the surf if their little piggies are protected. Simple slip-on booties, as long as they are flexible without being bulky or too loose (no Croc-like shoes or flip-flops), work great. Swim goggles (optional). Some kids can’t stand the saltwater in their eyes, or wear contact lenses and need the extra security of goggles. Travel games. Waiting for your food is a reality. We live the relaxed beach-life down here. Consider leaving the devices you used on the plane in the hotel room and bringing a few small, portable games to play instead like Crazy Old Fish War, Mad Libs, or a deck of conversation starters such as Loaded Questions (great for tweens and teens). Or bring that journal along and record the “best, worst, and funniest” of your day. Books. Some kids automatically bring a book along with them wherever they go. If your child is still learning to read or is more reluctant, try bringing something fun or new that they might enjoy like a comic book or a choose-your-own-adventure (these make fun read-alouds). First aid kit. Yes, there are first-rate pharmacies in almost every corner of the globe, but none of them will be as handy in the middle of the night as your well-stocked kit. Make sure it has plenty of Band-Aids, a pair of tweezers, and wound cleaning supplies, plus simple OTC meds like anti-inflammatories, aspirin, Benadryl, and Pepto-Bismol. And of course if your child needs prescription medication, it’s a good idea to bring double your supply in case of delays in your return trip or other mishaps. This goes for contact lens solution and spare lenses. Small knife with scissors. A knife is handy for slicing mangoes or spreading peanut butter on your breakfast banana, and the scissors are essential for small, everyday chores like snipping the tags off board shorts to prevent a rash or getting bubble gum out of someone’s hair. Peanut/almond/seed butter. Having a familiar and high-protein spread for bananas or even tortilla chips can be a lifesaver. Energy bars. Emergency fuel for between meals or for when your child needs a break from fish tacos. Great for travel days, too. Beware that chocolate coating or icing can melt into a goopy mess in minutes in the tropics. Decent walking shoes. At some point, you will feel like exploring, or want to go on an adventure besides surfing. Many surf resorts have access to family-fun activities like zip lines, estuary tours, bird watching, or even volcano tours. (You can book all these tours from our front desk.) Tropical climates have a tendency to make skin more susceptible to friction blisters, so bring a pair of broken-in sneakers and some breathable, cushy socks. Comfy clothing. Like most beach towns, Tamarindo has a causal, low-key feel, and depending on the time of year can be humid or even buggy at dawn and dusk. A lot of the fabrics touted by clothing companies as “great for tropical travel” don’t always work. Your child will likely be most comfortable in their regular clothes. They also may end up wearing the same swimsuit or trunks all day. Consider bringing a few long-sleeve tee shirts and a pair of loose, long pants to cover up from the sun or to guard against bug bites. Gifts that kids can give away. Your kids will bond with their guides/favorite waiter/surf instructors, and will make friends with local kids. It’s always fun to have something to give away or trade, especially if it’s something meaningful. Stickers from your favorite surf shop back home, hats, bars of wax, guitar strings, school supplies, tee shirts or even a pre-made business-style card they design with their email address and a photo of themselves (if this is age-appropriate). Being generous in this way spreads goodwill and can lead to lasting friendships. Should you bring your surfboard? Consider that you’ll have unlimited access to WRSC’s board cage during your stay—surely one of our hundred-plus boards will be satisfy your needs. And you’re probably not going to go shred double-overhead barrels with your kids, anyway. Most likely, you’re going to spend time with them in the break near the resort or head off on your own to catch a few waves during their lessons. Plus, traveling with surfboards is a hassle, especially on international flights. You’ll end up waiting longer for your boards at customs, which translates to fidgety, bored kids. If you can bear to leave your beloved board at home, it’ll mean a more efficient travel day and happier travel partners. What to carry on. Obviously, the huge bottle of sunscreen, the jar of nut/seed butter, and the knife have to ride in the checked luggage per TSA regulations. The special snacks and devices go with you on the plane. Also consider adding one spare set of clothing and one swimsuit/trunks per person to your carry-on. This way, if your luggage is delayed, you can still start your vacation without having to shell out a bunch of cash for new threads. Also, consider exchanging a little bit of money, or at least carrying some small denomination U.S. Dollars for your trip. This “seed money” comes in handy for things like taxis, food, and tips. That way, the ATM doesn’t have to be your first stop. 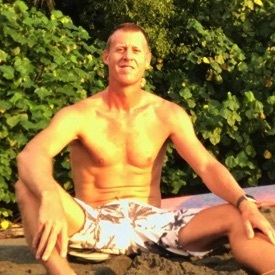 The most important item you can pack for a successful surf trip with your kids is your flexibility. Set your expectations on the surfing front low. 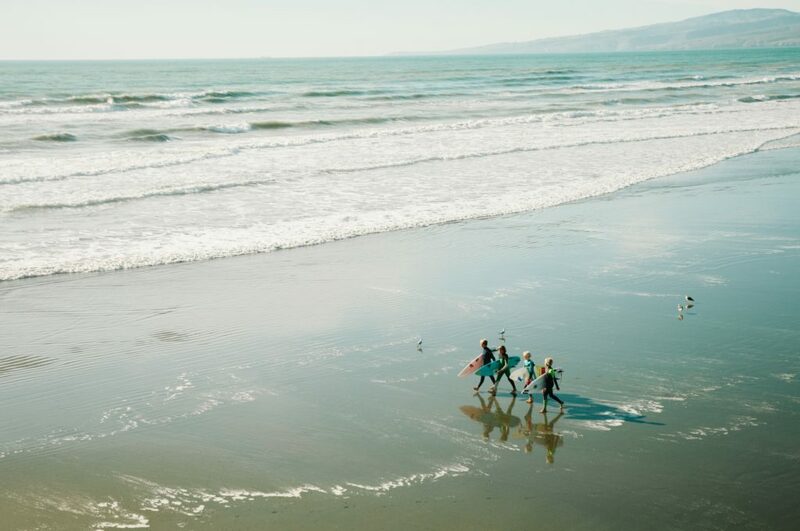 Your kids may go bonkers for surfing after having lessons and/or being exposed to consistent, warm-water surf every day, or they may decide that the zip line, a turtle-hatching tour or swimming in the pool is just as fun. Either way, you’re bound to have an incredible adventure that will bring you closer as a family and that you’ll talk about for years to come.